We call for a ban on political islam communitys caused by espionage against German laws and violated by the sword in his hand for the war preach in #Kurdistan. 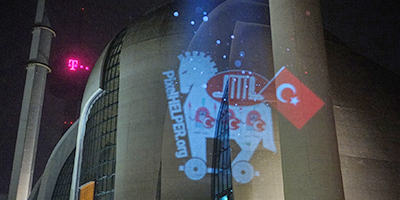 Light Art #Karikaturen to the DITIB central mosque – Cologne #Moschee The large largest mosque association in #Deutschland, #DITIB is connected to the Turkish religious Bureau #Diyanet. The Presidency of Religious Affairs calls for “detailed reports” on your #Imane activities of community members. The Turkish state Operates spy under the guise of religious freedom. 1. NY: Is responsible for the area A. and Actively working for this structure. He therefore holds after #Putschversuch July 15, Continues to adhere to its position. (…) 3. RA: Trat back to the coup attempt from the board of #Moscheegemeinde. Is a biological nephew of the sought on arrest warrants AA, a former author of #Zeitung #Zaman. Plays a role in the #Spendensammlungen this structure to #Opferfest. (…) 7. T. e. During studies here, she has lived in #Wohnheimen this structure and came to #Deutschland as #Braut. Even If They are not Actively Involved in the activities of synthesis #Struktur, They Should be inclined to this structure.